This pdf clocks in at 2 pages and is a mini-dungeon. This means we get 2 pages content, including a solid map and all item/monster-stats hyperlinked and thus, absent from the pdf, with only deviations from the statblocks being noted for the GM. 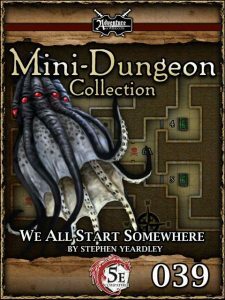 Unlike most 5e Mini-Dungeons, this does not come with player or VTT-friendly maps. Let’s face it – if most of us were to embark upon the life of an adventurer, we’d not look for Rappan Athuk, the Darkest Dungeon or a similar hell-hole to start off our career. We’d start looking for something that feels like we can actually survive it, right? Well, the complex near Raakayras is exactly one such place – relatively peaceful, yet manageable…and other adventurers will probably have taken care of all those really nasty threats…right? Well, things aren’t always as they seem: The complex depicted still sports some nasty traps and is the result of an aftermath of the deeds of a particularly nasty wererat, who poisoned wyrmling eggs contained in protective vats of acid…well, all but one, who since then proceeded to eliminate said scoundrel as well as the most dire of threats from the vicinity. Relaxing in an acid bath, slaying the remaining wyrmling will be a challenging endeavor…and actually one that may destabilize the region, beginning the campaign already with an emphasis on consequences I tend to enjoy. As a downside, the module fails to provide hyperlinked stats for both major antagonists featured herein. Secondly, when compared to the original PFRPG-iteration, some weird typos have crept into this pdf: “Of course, the party still has tomust…[sic! ]” as, an example. Editing and formatting are good, I noticed a couple of minor glitches. Layout adheres to a beautiful 2-column full-color standard and the pdf comes sans bookmarks, but needs none at this length. Cartography is full color and surprisingly good for such an inexpensive pdf, but there is no key-less version of the map to print out and hand to your players. Stephen Yeardley’s introductory complex presented here is challenging and the final boss can be downright brutal…but then again, it can also be a great kickstart of a new campaign, already featuring the potential for non-lethal conflict resolution, for reaping what one has sown and for a contextualization of the mini-dungeon within one’s preferred campaign world. Considering the limitations of the series, that is pretty impressive. At the same time, Kyle Crider’s conversion feels rushed; the lack of stats for the major players is a big downside and the new typos are puzzling to me. Alas, this does drag down the module quite a bit – which is why I can’t rate this iteration higher than 3.5 stars, rounded down.